Amsterdam is a place that has historic allure and canals that warm the heart with their charm and beauty. While there are many places that fulfill this requirements, Amsterdam is at the top of the list thanks to the romantic touch which the city has. It is actually one of the most popular and visited destinations in Europe. According to reports, it is Europe’s eight most popular city and the most visited in the Netherlands, which receives about 14 million tourists every year. These tourists turn to Amsterdam to have a time of their life, especially couples. This is because there are a number of activities to get involved in and a number of exotic sites to visit for couples. While the city was not initially developed for couples, over the years it has developed the image of a romantic city thanks to its fun family resorts that welcome couples and families from around the world. If you and your spouse are looking to spend holidays in a city that speaks of romance then Amsterdam is your best bet. But if you are still not sold on the idea, then let’s read out a bit more about Amsterdam and why you should pay this beautiful city a visit as soon as possible. The reason that Amsterdam has a low pollution rate is because the main means of transport is cycling in the city. The city has a separate bike lane on the roads with easy navigations. Couples can rent out tandem bicycles and paddle across the city together to enjoy the heartwarming sights the city has to offer. This will also save you a lot of money on transport since renting bicycles is a lot more cheaper than hopping on public transport or renting cars. Plus, bicycling is also a fun and healthy activity. It can bring two people close and if you do not already know bicycling, you can learn it here. 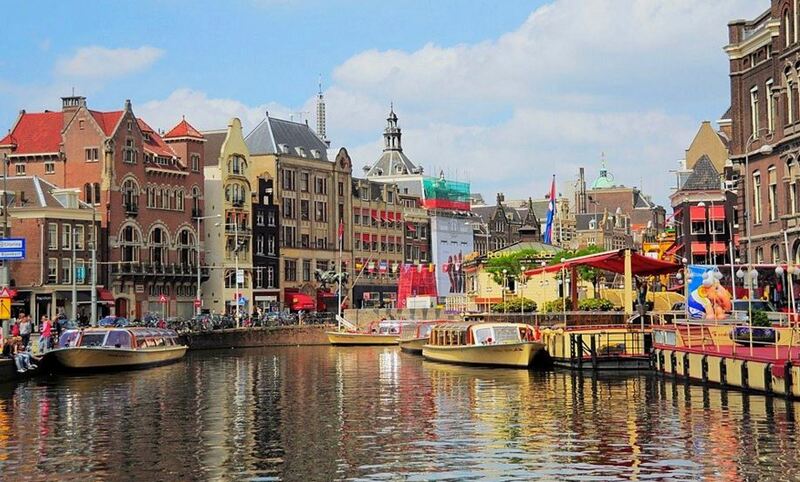 The canals of Amsterdam are the center of attraction for tourists. For couples, getting a ferry ride and exploring the canal belt is one of the most romantic things to do. That’s not all, they aren’t just ferry rides but some of the boats serve as floating restaurants and offer candle light dinners as well. You can have a memorable, romantic candle light dinner date with your partner and eat your favorite food while gazing at the beautiful sights as the boat floats around. A’dam Toren is one of Amsterdam’s landmark because of its uniqueness. It is built on 20 floors and each floor has something exciting to offer. The tower offers bars, a rooftop view of the city, eateries, a moving restaurant on the 19th floor, nightclubs, boutique hotel, shopping malls, nightclubs, movie theater and not to forget, one of the largest swing in the world. In short, this tower has loads of fun to offer, especially for couples. It’s a bar that has a living room at the front, a vast bar in the middle and a lit portion in the back for people who want to dance heavy. The place comes to life at night, and if you are lucky you may even run into some popular faces here as celebs often make an appearance here and popular bands also perform on and off. Plus, the drinks are really good and the crowd is crazy.Amsterdam is a fun city. It offers a lot, but if the hustle and bustle of cities is not your cup of tea then you can look elsewhere, such as the Caribbean islands where you can enjoy beaches and serenity.